Protect animals from predators and the weather with hen houses. 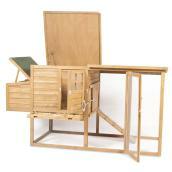 These hen coops support up to four chickens and include up to two nests and roosting bars. 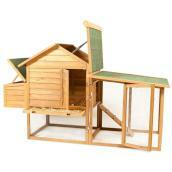 Along with sturdy, wood doors, and windows for easy access, the coops come in flat and peak hinged-roof designs. Pull-out trays simplify cleaning and maintenance. Use our selection of feeders to keep animals well-fed. Install drinking troughs to ensure animals have their hydration needs met. Browse our range of farm supplies to keep livestock safe and comfortable.